The Rabbit is a reliable lever style corkscrew. 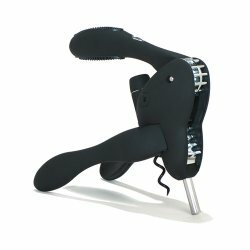 This rubberized 'velvet' finished corkscrew is recognized for its endurance and ease of use. Working on all types of wine bottles, the Rabbit can pull a cork in three seconds, immediately releasing the cork after it's been pulled. Made with die cast metal parts, the Rabbit also comes efficiently designed with an extra helix (spiral) and foil cutter.